Last week, Xamarin announced their Xamarin 2.0 product, which contains Xamarin Studio, a brand new version of MonoDevelop. Miguel describes the impressive amount of work that went into Xamarin Studio in his blog post The Making of Xamarin Studio. Xamarin Studio is written in C# and for a large part relies on GTK+ 2.x to make the product cross platform, shipping versions for Mac OS X and Windows, but Xamarin Studio should also run just fine on Linux. As an addition to Miguel’s blog post, I will describe some of the interesting work that we have done under the hood in our ongoing collaboration with Xamarin. At Lanedo, we have been working with Xamarin for the last 1,5 years to improve the GTK+ stack on the Mac OS X and Windows platforms. 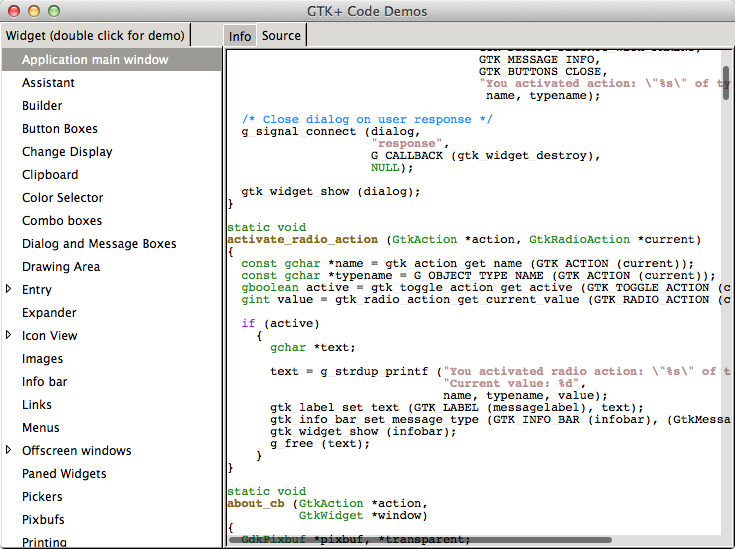 This work was based on the GTK+ 2.x stack, because MonoDevelop is a GTK+ 2.x application. We have made an effort to upstream all fixes and improvements that were suitable to be committed in the upstream projects. Where possible, fixes have also been merged into the GTK+ 3.x branch. Furthermore, we have helped with the implementation of the gorgeous GTK+ theme (available in the xamarin-gtk-theme module on GitHub) that is used in the product and makes Xamarin Studio look like a native application, and not look completely out of place on Mac OS X or Windows like GTK+ applications typically do. In my opinion, the approach that Xamarin has taken for theming will be useful for many other GTK+ applications running on Mac OS X as well. Many, many annoying interaction problems and crasher bugs with GTK+ on Mac OS X have been fixed. Such as non-working tree view expanders, broken key navigation, issues with window resizing, and gaps in clipboard support. Keyboard fixes for Mac OS X: everything with respect to keyboard modifiers and key mapping has been reviewed, several problems with typing dead accents, keyboard accelerators, etc., have been resolved. The GTK+ "testtext" test rendering glyphs from different scripts using CoreText, but through font fallback done in Pango itself. Xamarin sponsored the work to properly implement font fallbacks in Pango’s CoreText backend. As a result, text involving glyphs from different scripts will now render beautifully on Mac OS X.
gtk-demo with overlaid scrollbars. Though, for full admiration you really have to see it in person! We have worked very hard to make scrolling behave as native as possible on Mac OS X. Support for representing "precise deltas" from NSEvents in GdkEvents has been written, which already gives you much smoother scrolling on Apple hardware and support for momentum events (built-in kinetic scrolling). The next step was to have overlaid scrollbars and rubber banding, like native applications on Mac OS X Lion and higher. To achieve this, we actually place a CALayer on top of the NSView in which the GTK+ application is drawn, and draw the scroll bars in this layer. We have tweaked the event handling so that information about the gesture phase is considered, in order to be able to implement rubber banding. Unfortunately, this code is not in a state such that it can be upstreamed. Performance problems were uncovered in how GDK handled scrolling on OS X, apparently, much more of the widgets was being redrawn than necessary. These problems have been fixed and upstreamed, and scrolling is now pretty smooth. 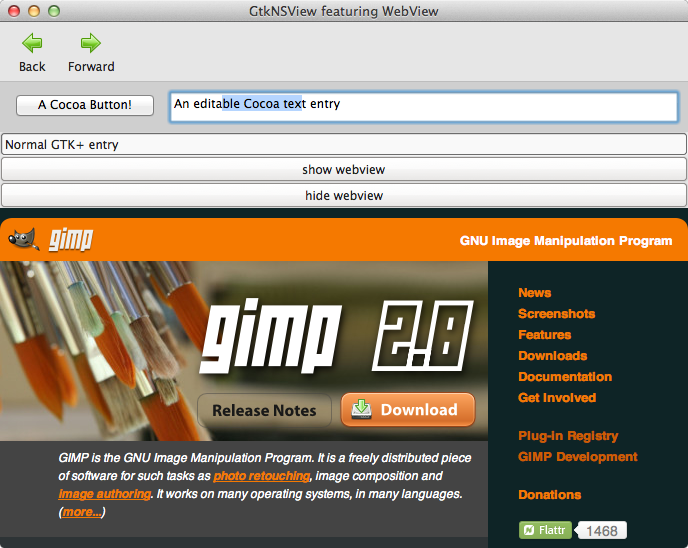 Cocoa controls embedded in a GTK+ application using GtkNSView, the web page is shown in a native WebView. Work has been done on a GtkNSView widget, which allows native Cocoa widgets to be embedded in a GTK+ application. For example, it is possible to embed a native WebKit control in a GTK+ application. Work on this widget is still ongoing in Bug 619155. Some improvements were made so that GTK+ applications render at higher resolution on Retina displays. This includes work to render stock icons at a higher resolution. A few Windows problems have been resolved, including a crash with Windows IME, font substitution and other minor problems. We have very much enjoyed working with Xamarin over the last 1,5 years and are grateful for the large contributions they have made to the involved upstream projects. In my opinion, the GTK+ 2.24 branch is these days in a very good shape for cross platform application development for the Linux, Windows and Mac OS X platforms. The work that has been done has immediately been beneficial for other applications, for example the native GIMP application for Mac OS X has been much improved. These days it is available as a proper application bundle in a DMG installer (due to the work by Clayton Walker) from the main GIMP download page and it works very well! We look forward to the continued collaboration with Xamarin to further improve the GTK+ stack for use by Xamarin Studio! When concluding the discussion on reference counting rules for nodes in an earlier blog post, we noted that these rules put limits on what kind of visible functions will function properly. The filter model must follow changes in its child model to keep the internal data structure up to date. As we have seen, changes can only be expected to be received for levels in which the filter model has a reference on at least one node. By default any references obtained on filter model nodes are passed on to the child model. So, the filter model will receive signals for all nodes that are visible in the filter model’s observer. This is not enough to support an often used use case. If we, for example, want to only show a parent node if one of its children is visible, we need to monitor signals received on the child nodes, also when the parent node is hidden. Once one of the children changes state such that it will become visible, we must make the parent visible as well. Clearly, when the parent is invisible, its children are not referenced by the filter model’s observer. Because this use case is so often used, we have made GtkTreeModelFilter explicitly support it. This is done by building child levels in the internal data structure of each node that could be visible. When a child level is built, a reference is obtained on the first node in that level. A node could be visible if any node in the level it is contained in (so any sibling) has been referenced by the filter model’s observer. Note that we thus look at the reference count of a level here and not at the reference count of individual nodes. We must also build the child level for invisible nodes contained in a visible level. Such child levels are monitored for changes and for every signal received a check is done whether this changed the visibility state of the parent node. This explicit support is limited to dependencies from a node on its child for the node’s visibility state. If you want a node’s visibility to depend on the children of the node’s immediate children, you are on your own. In such cases you can either rely on GtkTreeStore, which always emits signals for all nodes because it does not implement reference counting, or obtain references on the additional child levels yourself. To wrap up, we can in general say that visible functions should only use data or properties from the node for which the visibility state must be determined, its siblings or its parents. Because of the explicit support for this, it may also use data or properties from its children. If any other data is used, the filter model may not work reliably. GtkTreeModelSort and GtkTreeModelFilter basically proxy the shape of their child model, including modifications. Internally, the models proxy incoming requests from their observers to requests on the child model. A mapping is needed from nodes exposed by the sort and filter models to nodes in their child models. Since the models can “perform” modifications, the mapping must be able to deal with these modifications. The mapping is internally implemented as a tree of nodes that are visible in the observer (i.e. the observer took references on these nodes). Each level is an array of nodes. When we hand out an iterator to the observer, the user data of the iterator is set to a pointer to the node in the array. When the iterator is used, we can very quickly access the node in the internal data structure. Using data in this node (for example index into the level in the child model) we can construct an iterator relative to the child model to forward the operation. Sometimes we can even cache these iterators. A node can have a “children” pointer set to point at a child level. Using arrays works well — we have been using GArray for a long time — unless the internal data structure is subject to frequent changes. This either happens due to a lot of activity in the child model, or due to filtering activity. When adding and removing nodes in the GArray, memory has to be moved. When the array is large and this happens often, this becomes very costly. Xavier Claessens noticed this and wrote a patch to replace the use of GArray with GSequence. This significantly sped up operation of the filter model in certain cases. We have committed this change as part of the “treemodel-fix” branch last year, but only after we got a lot more of the sort and filter model under unit test. This way, we could ensure that no regressions were introduced when migrating from GArray to GSequence. Never take a reference on a node, without owning a reference on its parent. This means that all parent nodes of a referenced node must be referenced as well. Looking at this from a GtkTreeView perspective, this rule will never be violated. GtkTreeView will always take a reference on every node that is present in GtkTreeView’s RB tree, which contains all children of expanded parents. Naturally, GtkTreeView cannot expand a parent which is not visible itself, so parent nodes are always referenced. When you are implementing your own GtkTreeModel, you are free to reference whatever you want. In this case, it becomes important to adhere to the rules. When GtkTreeModelSort or GtkTreeModelFilter is set as the child model of your custom model, things quickly go wrong if you do not play by the rules. The sort and filter models aggressively empty their internal data structures of nodes that are no longer needed. This process is based on the current reference counts of the nodes. So, when you reference child nodes without holding a reference on their parents, a parent might eventually end up at a reference count of zero while its children are still visible. A parent level might wrongly be pruned from the cache, corrupting the data structures. (Of course, the sort and filter models could enforce the rule for you by referencing all parents when a node is reference, but this significantly hampers performance because many more virtual ref/unref calls are done than necessary). Outstanding references on a deleted node are not released. So, once you receive a row-deleted signal for a node in your model, do not expect any unref call for that node to follow. You can implicitly erase all references. If you are not the model implementor, but instead have a couple of references on nodes in this model, then do not release references of a node once you have received the signal that that node has been deleted. (This actually implies you will have to listen for row-deleted signals if you have references on nodes, or you use a GtkTreeRowReference which will be set to NULL once the node has been deleted). It is clear why this rule is there: by the time you receive a row-deleted signal for a node, the node no longer exists in the model so you cannot get an iter to this node to perform the unref call. Models are not obligated to emit a signal on rows of which none of its siblings are referenced. To phrase this differently, signals are only required for levels in which nodes are referenced. For the root level however, signals must be emitted at all times (however the root level is always referenced when any view is attached). What is this rule trying to say at all? Imagine you have a ref-counted model, some node in the root level has a couple of child nodes and only the nodes in the root level are referenced. This means that none of the nodes is currently expanded. The rule says that, as a result, any signals for the child nodes (e.g. row-changed if a child nodes changes) do not have to be emitted. Makes sense — what view is interested in signals of nodes that are not displayed in the view anyway? In general, you are indeed not interested. But the for GtkTreeModelFilter this rule is very important in order to properly handle a sensible use case. Imagine that you have a filter on child nodes. You only want to show an expander arrow next to the parent node if any of the child nodes is visible. To handle the expander arrow correctly, we must receive events for the child nodes, also when these nodes are not referenced. GtkTreeModelFilter handles this by explicitly obtaining a reference on one of the child nodes if a parent is referenced. Due to this rule, a reference on a single node is sufficient to start receiving signals for this level. In summary, we can say that good understanding of these rules, which seem so obvious, is crucial when implementing a model like GtkTreeModelFilter. The rules are used to determine when it is required to emit signals and when levels in the internal data structures can be cleaned up. I can go into more detail on what is involved in GtkTreeModelFilter, but that is probably not of that much interest. What is for example required is to for each node maintain two reference counts; it’s actual, real, reference count and it’s external reference count. The external reference count maintains the reference count based on the ref and unref calls received from the model’s observer. This determines a node’s visibility, so should not be mixed up with any reference on the node taken internally! As we have seen, these rules also put limits on what can be done with a visible function in GtkTreeModelFilter. More on that in a later blog post. Many people are confused by what exactly the reference counting methods ref_node() and unref_node() in the GtkTreeModel interface are intended for. These methods are a way for views (or more generically, model observers) to let models know when nodes are being displayed. For example, GtkTreeview will obtain a reference on a node when the node is visible and release the reference when the node becomes invisible. And this is immediately the main source of the confusion: the confusion typically centers around the exact definition of node visibility. A node is visible when it is visible on the screen, that is, the user can currently see it. This is the most obvious definition of this term. For a node to be visible according to this definition, the node’s parent must be in expanded state, secondly, the coordinates of the node must be within the coordinates that are currently visible in the tree view’s scrollable viewport. A node is visible when its parent node is in the expanded state (or the node is in the root level in which case you can say that it is always visible because its implicit parent is always in expanded state). Do note that when a node is visible according to this definition, it might not be immediately visible to the user! This definition does not say anything about the current position of the scrollbar. For the reference counting mechanism of GtkTreeModel, the second definition is in use. So, what is the point exactly in knowing whether a node’s parent is expanded? The design rationale of the reference counting mechanism is to be able to delay loading content of child nodes until it is really necessary. A useful use case is a file system model. You do not want to load in an entire file system tree when the model is being instantiated. Instead, only the root level is loaded. All nodes in the root level will be referenced when the model is attached to a view. In response to this, one could decide to load ahead the child nodes of the root level nodes. Once a root level node is expanded, the children of this node get referenced, and so on. Similarly, when nodes are collapsed, nodes are unreferenced. This information can be used to possibly prune nodes from the tree which are no longer necessary to keep in memory. Rather unfortunate is that usually you want to avoid loading child nodes if the parent node has not yet been expanded. Especially when you are for example operating on a remote file system. A preferred approach is often to delay loading the nodes until the parent is expanded, displaying a “Loading …” node in the level until the real child nodes are retrieved. The reference counting mechanism does not really aid you to implement that, except that you can re-use it for cache pruning. The reference counting scheme is not of much use for lists either. Generally, for lists, developers are mostly interested in the first definition of visible. When dealing with lists with large numbers of nodes, you want to avoid loading all data from the data source if this is expensive. Alas, because all nodes in the root level get referenced as soon as the model is attached to a view and there is no relation between the reference count and whether a node is visible on the screen, other methods have to be used to implement this. The fact that models are separated from views and that there is no mechanism to relay information about which nodes are visible on the screen to a model, makes it hard to implement this. What is really needed is a proper “lazy loading model interface”, such that views and models can exchange information on this. The scheme does work very well for GtkTreeModelSort and GtkTreeModelFilter. These models actually must load child nodes as soon their parent is referenced. GtkTreeModelFilter must process the child nodes (i.e. performing the filter function on these nodes) in order to determine whether the child nodes are visible at all and thus whether the parent node actually has children. Recall that as soon as a node is visible, it is queried whether it has any children such that an expander can be drawn next to the node. I have a confession to make. Years ago, I told people who wrote GtkTreeModels that implemented reference counting to emit GtkTreeModel:row-deleted before actually removing the node from the model’s internal data structures, contrary to after like the documentation suggested. GtkTreeModelFilter and GtkTreeModelSort have worked like this for years. It turns out I have been wrong, and I now finally understand why — I failed to correlate two commits which fixed related bugs back in 2002. I continued to refer to this comment even in 2007. During that e-mail thread, I did notice a single line in gtktreemodel.c mentioning that “Please note that nodes that are deleted are not unreffed.”. But clearly, the contrary was happening in February 2002? Deleted nodes were being unreffed. It turns out that these faulty unrefs were caused by another bug which was fixed in April 2002! Unfortunately, I failed to correlate these commits and continued to be wrongly convinced that emitting row-deleted after really removing the node could be troublesome. The good thing is that this is now documented together with other rules to take into account when dealing with reference counting (blog post on this will follow) and it is now unit tested, so it cannot happen again. So last August (ahem) I announced the merge of the treemodel-fix branch and a blog post series on interesting things that I’ve learned while working on treemodel-fix. By the end of the Summer, I got carried away with other things. To make sure things do not go wrong this time, I have already written all posts and will be publishing them in the coming two weeks. It is a bit late, but since the code is still the same and the details are quite interesting, I thought it was still useful to do. Back in 2010 I started working on a CoreText backend for Pango (blog post 1, blog post 2). I got into trouble with implementing fontsets properly, so the code bitrot on my disk for a full year until I decided to commit a barebones version of the backend without fontset and font fallback support in April 2011 (blog post). In the second half of 2011 Xamarin and Lanedo teamed up to improve GTK+ on Mac OS X in order to enhance the experience of the MonoDevelop IDE on OS X. Part of this work was to implement proper font fallbacks. This means that when characters are to be rendered which are not in the current font (for example Japanese characters which are not present in a Latin font when rendering mainly Latin text), we should fallback to another font containing these characters instead of drawing ugly boxes with hexadecimal numbers. This allowed me to dust off the fontset patches I started working on back in 2010 and to investigate how to make fontsets work in the CoreText backend for real (nasty details are available in bug 647969, especially comment 3). We ended up with something that works nicely on both Snow Leopard and Lion. The reliance on a CoreText symbol that’s not in the header files (not nice, I know) has not shown to be a problem so far. In conjunction with this, we also improved the shaping engine of Pango’s CoreText backend. The shaping engine can now better deal with the output from CoreText’s typesetter which we use to obtain the list of glyphs to render. Especially dealing with zero-width spaces, in both rendering and cursor handling, now works properly and was completely broken before. For some other corner cases (in particular with regard to some non-Latin scripts), we have ensured these are dealt with such that no crashes occur elsewhere in Pango. To fully support these cases, the shaping engine could use further improvement; see the source code comments. All of this work is available in Pango’s master branch. It is great to see this upstream, together with the many other improvements we have made together with Xamarin so far! Last week I attended the first LibreOffice conference in Paris together with the Lanedo LibreOffice hackers. Lionel Dricot gives a nice summary of the buzz at the conference in his latest blog post. I figured I had to put the new crazy-fast machine Lanedo bought me to use at this conference, so I decided to attempt to build LibreOffice using Clang on Mac OS X. My expectation was that this would be too large a task for a single weekend, but to my surprise I managed to get to a completed build during the very last minutes of the conference. Unfortunately, the resulting executable crashes on start up :) So there’s still some work to be done. The patches that were needed to complete the build have been submitted and I wrote up a wiki page about the remaining issues. See the mailing list post and the “Building LibreOffice with Clang” wiki page. In the near future, I hope to fix things so that the resulting executable will actually launch and work correctly. Also, it should be interesting to try to compile LibreOffice using Clang on Linux (faster builds! warnings that a human can actually understand!). Effective immediately I will be reachable at kris (at) loopnest.org instead of my old gtk.org alias (or in addition to gtk.org when gtk.org mail comes online again). The e-mail address attached to my Bugzilla accounts will be changed in the coming days as well. I will not be rewriting my e-mail address in commit history, but will start committing with my e-mail address from today on.